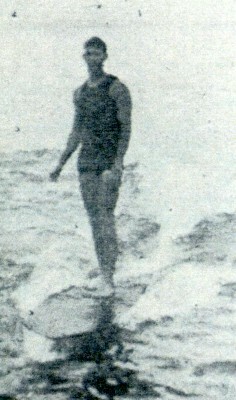 Duke Paoa Kahanamoku : Riding the Surfboard, Part 2, 1911. Kahanamoku, Duke Paoa: Riding the Surfboard, Part 2. Volume 1, Number 2, February,1911, pages 151-158. Many thanks to Sara, Shoalhaven City Research Librarian, in locating this article. For a analysis of part 1 and part 2, see the introduction to part 1. 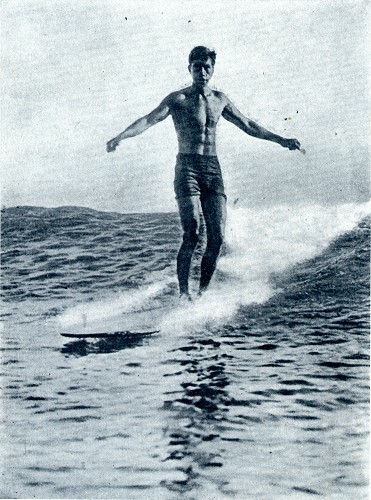 1911 Duke Kahanamoku (Ford) : Riding the Surfboard, Part 1. 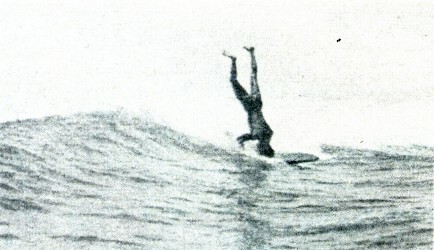 While both parts of the article are said to be accredited to Duke Paoa Kahanamoku, in 2011 Patrick Moser noted that the publisher, Alexander Hume "Ford is clearly the author of the article." In the second part, the bulk of the article (ostensibly Kahanamoku) "quotes" from "one who learned," that is Alexander Hume Ford. Although this account has strong similarities with some of Ford's previous writings, it appears that this "quotation" has been independently prepared for this article. 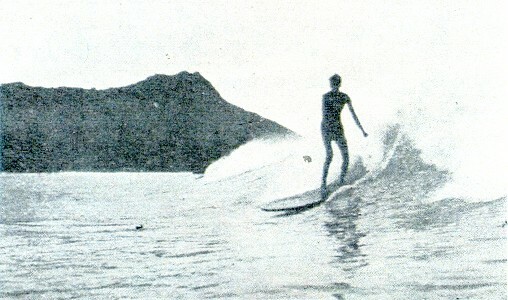 Alexander Hume Ford: Riding Breakers - Sport of Waikiki. 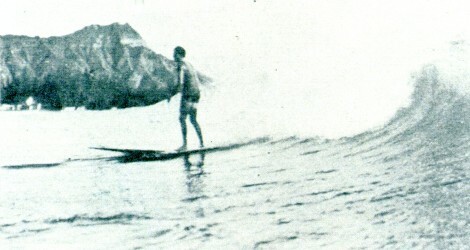 Whereas the text reports that "the champion surfer of the Islands" is "a young hapahaole (half-white, half-native)," that is George Freeth; the first part of the article is said to be written by "the recognized native Hawaiian champion surf rider" and the photograph on page 157 is captioned "Duke Paoa, the Champion." That Kahanamoku would write that "feats were accomplished by the haole never dreamed of by the kanaka" (page 158), strains credibility. Freeth is not mentioned by name in the article, Ford preferring to obliquely refer to his identity in the manner of his contemporary, Jack London. Cruise of the Snark, Macmillan and Company, New York, 1911. On pages 156-157, Ford repeats his unsubtantiated claim that the "young hapahaole" (Freeth) was the first to surf on America's Atlantic coast sometime before 1907. Alexander Hume Ford: Freeth Will Ride Atlantic Rollers! The Hawaiian Gazette, Honolulu, June 28, 1907, page 6. The article is enhanced by a wide selection of photographs, some of which have been cropped here. 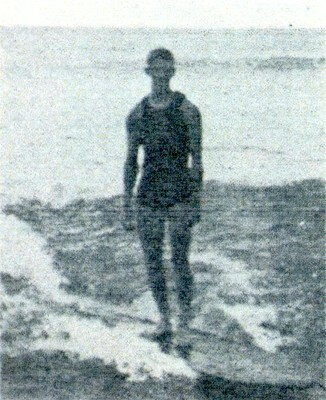 One of the accompanying photographs of Duke Paoa Kahanamoku by A.R Gurrey Jr. was widely printed in other contemporary works, noted below. Note the photograph on page 157, a rare image of surf board riding not at Waikiki, and probably not on Ohau. Other Articles by Alexander Hume Ford. 1911 H. F. Alexander (Ford) : Water Sports of the South Sea Islands. I was given a board, a hit of redwood, pointed at one end, not six feet long, about sixteen inches wide and perhaps an inch and a half thick. "Just follow us," called one of the three eager tutors selected from the delighted group of would-be instructors. Nearly a mile out at sea the big, long billows, for which we were headed began their thrilling run, to break and reform thrice before reaching the beach. The first bit of advice from my tiny tutors was: "'If a breaker does strike us, just duck the bow of your board and it will go through." . Each of the youngsters was now laying fiat on his board, the tips of his feet just lapping over the end, and the small arms revolving like windmills as the three boards flew through the water, while mine lumbered on far behind. "Come on" they called in chorus, and I tried to obey. The first of my troubles was that my chest where it rested on the board began to chafe and ache; this the small boys pleaded with me not to mind, as in a day or so I would not notice it at all; this I later found to be true, but that first afternoon it did not seem possible that my ribs would not in time tear through the skin. In the Small Surf Near the Beach. lunui" (big wave coming); then "Hoe ! - Hoe !" I felt myself lifted on the advancing slope of the oncoming billow, three pairs of active young muscles gave my board a great start forward. The advancing waters caught it and I lunged onward and downward as though shot from a cannon. I was well forward on my board- in accord with instructions carefully instilled, my feet flew up into the air- I clung to the bow of my plank and with it did a series of cart-wheels to the accompaniment of a chorus of cheers and shouts of laughter; the small boys had also plunged forward, using their bodies as animated surfboards, and were riding my wave au-naturel. As it finally passed me by and I came up in its rear I could see their smiling, happy faces on its crest turned toward me. There was a chorus of "You were too far forward on your board,"an exchange of gleeful chuckles, and the three youngsters descended on my side of the wave to give me the second degree. I was told to hold the board amidship and half kneel; it was explained that in this posture the wave would strike and carry me on at great speed. It did, but the board was left behind. Other youngsters of all shades and complexions, and gleaming hides, that shone dripping and resplendent in the sun, had now gathered to witness the sport, and everyone was invited to participate in the giving of the great third degree. From the crest of the wave a brown skinned native Hawaiian dived from his board and arose beside me to shout confusing orders in my face- from the other side another youngster dived from his board and arose to grasp mine. It tilted, and there was a shout of glee; it took the great green wall of water on the bias, skimmed along at accelerated speed- diagonally- and I could see the havoc that was coming; boards dove under me- boys over me, and one landed on the small of my back; there was a general confusion and mix-up in the seething waters, and I emerged from the third degree coughing and spluttering to be taken in hand for my diploma and final 33rd degree. On the Center of the Board. Steady and even she rode the wave, then the cry came to "stand !" "Come on, then- let her go." It was easy enough to understand just how the thing was done by watching others go through the operation- but that was no practical help. Coming Down the Base of the Wave. you'll wonder how it was you didn't get it the first day." There were many things to learn before I could hope of my own initiative to catch the wave. First I must acquire a speed that would send me through the water as fast as its movement at the base of a billow. I must develop muscle that would stand for continued stustained effort; only practice would perfect the windmiIl stroke, and that I must acquire. True, I might learn to ride in on the minor waves that break near the beach- mere ruffles- by pushing my board forward and throwing myself upon it, but comparatively, that was tame sport, and even that I found difficult of accomplishment. My young friends grew earnest ill their efforts to teach me the trick as the days grew into weeks and they saw that I stuck at my task. times six, and a week of torturing sunburn through it all. In the shallows I could stand knee deep, the end of my board braced against the pit of my stomach, sometimes a score of small wavelets would be allowed to pass, and then the real wave would approach, anxious eyes would watch, and at the pyschological moment the cry of "go" would issue simultaneously from several mouths, and I would urge my board forward. Often all was failure, because I failed to kick and paddle at exactly the right moment and in exactly the proper way; sometimes by an accident I never analyzed, I blundered into the right combination and shot forward on the down slide of the wavelet. I could not understand how with all my exertion and energy, I invariably fell in the rear and sank, while my comrades seemingly with littIe effort and the gentlest of gliding motions shot ahead and kept the crest of the waves just behind them, while some few, even upon the tiniest of wavelets, stood upon their boards and urged them onward with a shoving movement of the foot. It seemed to me that my teachers must give me up as an inapt pupil, and they did, wiith the bit of encouragement that, "only experience" would teach me. A young hapahaole (half-white, half-native) took pity on me. in the surf- the first time in America, doubtless, that the little board was used in our breakers- and half an hour after this hero took me in hand I was riding the surf to my heart's content. The first bit of instruction from my new tutor was to balance myself; he showed me how in shallow water he could stand until the wave was almost upon him, and then spring sideways upon the board, balancing so that resting on the tips of two ribs he could wheel about as on a pivot- then he showed me how, in deep water, to mount my plank with a sideways motion. "First," said my instructor, "I want you to learn how to go before a wave; get on your board, now put your arms out straight, perfectly rigid - go." The wave came, there was a gentle shove from behind, I kicked my feet up and down as instructed, and shot forward- it was a complete success. "That acts as a brake," said my instructor; ''as long as you keep your arms rigid you can go before the smallest wave, but the moment you bend them, back you slide. The bigger the wave the farther back on the board you should be, then as you get in front of thewave and it begins to wear itself out, work yourself up to the forward end of the board without bending the elbows. Never let anyone fool you into getting behind your board and starting by putting the end of it against the stomach and springing forward with the wave; someday a big wave wiII come along, lift you up, the bow of your board will strike bottom, stand on end, and there you'll dangle- if the board strikes coral it may split and you'll be lucky if you escape disembowelment- I've seen it happen- the deep water for mine." And so with sensible hints here and there my instructor quickly initiated me into the mysteries of the board; its secrets became mine. 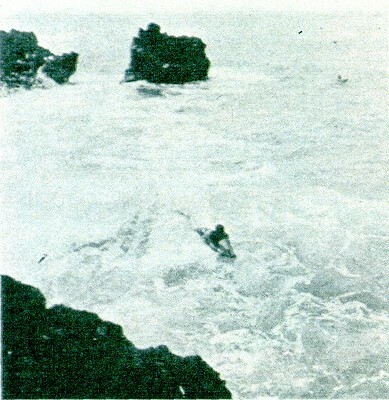 Surfing Off a Rock-bound Coast of Hawall. water by remaining on my board and watching for the proper wave. But there again I had to be taught how to judge the waves and which to trust myself upon- in fact, with the instruction of a man who knows how to teach, anyone may acquire the art of surf-boarding to perfection. I learned not to take the dull, heavy-moving waves or the double ones, but to wait patiently for the oncoming roller with jagged, razor-like edge. Then at the right moment my arms would go swinging around, my board would gather momentum, I would feel my feet lifted high in air and, then the everlasting race down hill- or perhaps I would be lifted to the crest of the wave, my head and shoulders clear- where I could gaze down at the hollow six or eight feet below. Sometimes the rushing crest would break and I would be hurled from my board, which would fly ten feet in the air, while I would drop into the abyss, my arms outstretched. and perhaps for a hundred yards be carried forward with the speed of a cannon ball before the wave, surfing without a board. At other times. as it more frequently happened. my board would shoot downward, no matter how far back I slipped, until I would take a dive far- far- down- and, released from all weight, the board would shoot high in the air, while I remained under water for as long as I could so as not to I meet the descending piece of wood. I was soon ready for my lesson in standing on the board. Each local expert explained how it was done, and I made the attempt. At first I turned the board over the moment I drew my arms down to clasp its edges firmly, preparatory to lifting myself up. Wild cries of delight notified me that I had missed again. It was my ever generus tutor who once more came to the rescue. "Take a big board at first," he said; 'a wide one, then rise just as you break through the wave and your board lies flat in front of it. Rise quickly by sliding your hands back to the middle of the board, rise from the waist line, one foot in front of the other as though kneeling; then spring up." I did, and over I went to the intense delight of my juvenile audience that caught each wave and even circled about me. Gurrey Jr, A.R. : The Surf Riders of Hawaii. Volume XLII, August, 1915page 924.
firmly plunged down from the top of the breaker to the hollow, missed the usual dive, and skimmed along at breakneck speed. It was now or never - I leaped to my feet in the rush of waters, my board stood firm and steady, I did not dare move, and my arms swung like windmills as I endeavored to keep my balance- each moment I expected to fall- my wave died out as another onrush took its place, and still I stood. I could not believe it - I knew it was all a happy accident; the beach rushed to meet me, and suddenIy I stood upon my board on the sands, lurched forward and sprawled full length, high and dry on the beach of Waikiki. Far, far out in the big breakers were my former tormentors; they raised themselves on their boards and cheered. I was no longer a malihini. I was a kamaaina (an old-timer), and as such I was accepted thereafter by the boys of Waikiki. When it had been fairly demonstrated that the white man could learn all the secrets of the surfboard acquired by the Hawaiian-born, the beach at Waikiki took on a new aspect. The people of Honolulu turned their attention to the reviving of the old-time Hawaiian water sports. Hundreds learned to ride the surfboard, and feats were accomplished by the haole never dreamed of by the kanaka. During the visits of the fleets, surfing carnivals were held, small boys and men, to the astonishment of the jackies, came in upon their boards, on their heads. At night time the expert surfers carried red light contrivances on the bows of their boards, and in the caps on their heads, matches, with which they set off the glaring colored lights just before they caught some monster wave, and then those on the beach were treated to the sight of radiant gods of the sea ontlined against the darkness standing upon the white crests of the waves, which they rode, as we have seen the acrobat in a circus ride his milk-white steed, erect and elated, only these gods of the sea approached more rapidly than could the swiftest horses, and as they stepped, after their mile run, from the tip of the wave to the hard sea sand of the beach, others took their place to demonstrate that the most thrilling sport in the world- surfboarding- is the possible accomplishment of anyone who makes up his mind that he will master it. Geoff Cater (2013-2016) : Duke Kahanamoku : Riding the Surfboard, Part 2, 1911.